~Bunny Lane Designs~: The Fortune or The Cookie? So of course using my light box and a fantastic camera, I made the fortune cookies look even more scrumptious. I picked up my order and I don't know about ya'll, but I always have to make sure that they gave me my fortune cookies. Its not the fortune I care about-I could really care less about the fortune inside, I've gotten the "You'll win the lotto" several times & well I'm still broke, still waiting for that fortune to come true, but I just love how it tastes. I'll add a recipe that I've tried before and it just tastes really good fresh! So these perfectly shaped fortune cookies made me snap to attention. I'm always looking for things to add to my items as a giveaway to my customers whenever they purchase things for example; magnets, cup cozy's, mini-wallets holding my business card, just that sort of stuff. 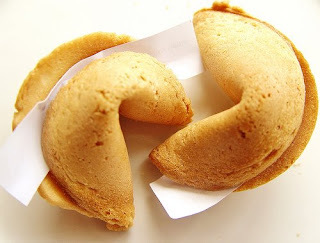 Now I'm not chinese at all, and anyways the fortune cookie idea came from America, but I decided I wanted to make a fortune cookie out of fabric and add my label inside like the paper fortunes---DING DING DING DING!!!! I'm sure people have already done this, but let me have my moment, and for figuring it out myself. ---By the way those participating in the swap--this is a good project for using up those scraps. I loved it, and the fact that it's a NO-SEW project folks?! All you need is fabric, fusible, glue, and some beading wire & you're good to go. I should have taken some photos while I made the rest, but I just couldn't stop until I was done. They were just too easy to make. I'll post steps later when I make some more. 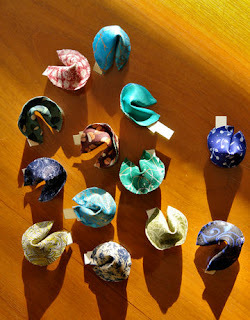 For now here are the fabric fortune cookies.....ta da! I'm still figuring out how to make the box, I'm gonna wash the chinese box and take it apart and use that for a template--once I'm done eating my leftovers of course. So I thought I would share this little project. So until next time, JOIN THE SWAP, and keep craftin'! How cute! Great to be inspired by little things. Cute!! I forward you a little something that gives you the breakdown of a take out box...a few different size options actually. What an incredible idea. I'm so impressed.